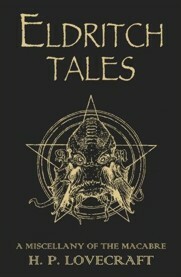 I picked up Eldritch Tales thinking that it was the other collection that Gollancz have released of H.P. Lovecraft's work, which has most of the more famous stories within. I found out that I was much mistaken very quickly. No matter, I thought. I'd been looking to read Lovecraft's work for a while now, since it tends to be a bit weird trying to run a Call of Cthulhu game when you have next to no knowledge about the Cthulhu mythos. Should I have started with the more famous stuff? So, the positive stuff first. When Lovecraft's writing is focused, then he can pull off some really fantastic atmosphere and create genuinely tense, creepy situations. Stories that come to mind in particular are "The Picture in the House" (where we find that picking your shelter from the rain really matters), "The Terrible Old Man" (a heist that goes terribly wrong), "The Temple" (supernatural horror on a submarine) and "Two Black Bottles" (a priest's descent into realms that should be left well alone). With those stories, as well as some others in the collection, there's just the right amount of weird coincidences and glimpses of whatever lies beyond the realm of our understanding to create a really unsettling mood. In addition, his poetry (a part of his writing that I had not anticipated) was actually not as terrible as I had feared. In all honesty, I am not really one to pick up a poetry book if a prose alternative is available; I have my favourites, but I don't actively seek it out. Despite that, I found Lovecraft's poetry to be largely well-written, with only the odd dud. People who are more discerning with poetry may not share my opinion, but it is far from the terrible mess that I expect from most prose writers. A sensitive, educated male protagonist. All of his characters seem to be these young men, usually the last in an old prestigious family, who are highly read and rarely seem to have a jobs that would make an interest in the occult seem weird. I had the same generic male figure in my head for pretty much every main character. Racist undertones. If ever there is a non-white, or sometimes even just non-American, appearing in story then they are either servants with little intelligence beyond that of an upright animal, or they are the insidious purveyors of eldritch horror. The fact that the whole "black man = monkey" comparison comes up more than once as a plot point is really uncomfortable. Elitist undertones. Similar to the above point, if anyone doesn't have an aristocratic education, then they are ignorant peasants. The fact that they seem to be right about most of the scary stuff is largely ignored in story. Often this and the above point combine. Can't educate anyone but the white man, right? Marble ruins. Just... marble. Everywhere. Seriously, if a ruin of a temple or stately garden is needed, I can almost guarantee that it will be marble. Even ruins from Ancient Ireland. Terrible, TERRIBLE dialogue. It gets especially bad when he's trying to imitate accents. He uses more apostrophes in his dialogue than he does in the names of eldritch gods. There should have been an intervention. Bizarre and amusing metaphors. Less common than the above, but always good for a laugh when you find them. My personal favourite is when he describes a sinister laugh as "a deep, guttural chuckle like that of a giant turtle which has just torn to pieces some furry animal and is ambling away toward the sea." I want to know just what he thought turtles were. Stories that just stop. It doesn't happen all the time, but there are some where it's obvious that Lovecraft got to the end of what he wanted to include in this plot, so he just finishes it there regardless of grace or atmosphere. The dream-related ones tend toward this more than the horror ones, in case you wish to avoid this. It ended up feeling like I was reading the equivalent of a B-movie that launched a sub-genre. You know that it is an important milestone in fiction and you feel like you should appreciate it more. But instead you sit there silently mocking the parts that don't quite come up to scratch. I had two main feelings when it came to the negative stuff. First, there's the more problematic discomfort. With Lovecraft, I came into it knowing that his opinions are hardly what you'd call popular opinion these days in terms of racism and classism, but it still caught me a bit off-guard quite how blatant he could be on these topics; the story "The Street" in particular comes to mind, simply because the entire premise is how the noble intentions of the original colonists has been corrupted by Native Americans and foreigners. If you have real issue when it comes to stuff like race politics, then I might give Lovecraft a miss or at least be very thorough in prior research. Second, there's the gentle mocking. These were the stories where the flaws were there, but mostly harmless. They might have taken away from the suspension of disbelief at times, but the stories were the flaws were mockable, I couldn't bring myself to dislike them because it was just so earnest. He overestimates his abilities at times, but at least he tried. Yeah, you really should have started with his most famous stories (i.e. : the Necronomicon collection you aldue to)! Most of the problems you listed are still to be found, but you'd still have come away with a better impression of his work. That said, "The Picture in the House" and "The Temple" are a couple of my personal favorites that don't usually get mentioned - I'm glad you noticed them!